A hard cracker made from bread dough that is formed into a long circular stick shape. The dough, typically made with wheat flour, is baked throughout so the inside and outside are very crispy. 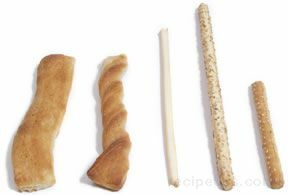 Bread sticks are available in a variety of lengths and diameters, as well as flavors, such as garlic and sesame seed. This cracker can be used nicely as an appetizer or served with soups and stews.